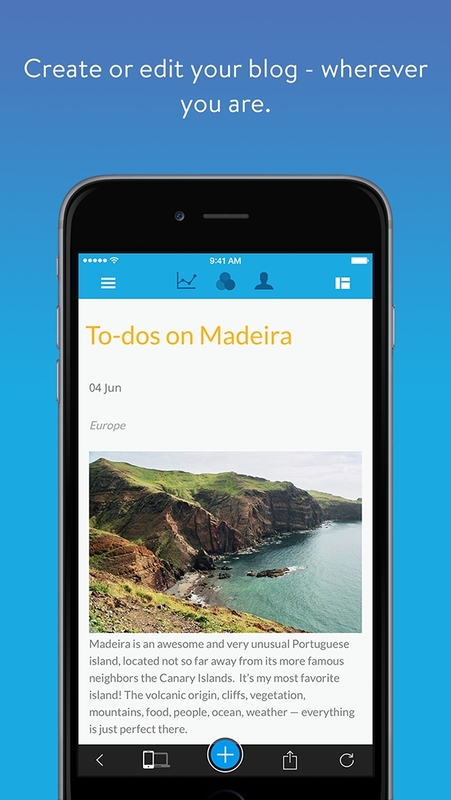 The Jimdo App for iOS. Tell it to the world. Your idea. Your website. 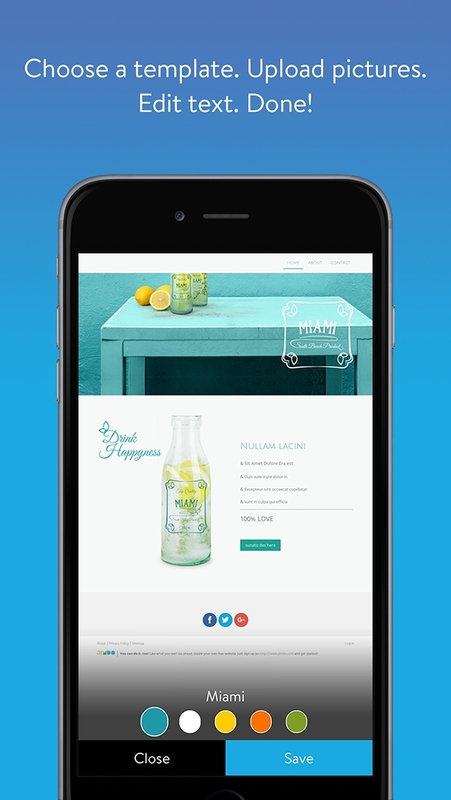 With our free Jimdo app for iOS, you can create your website easily on the move, or make changes to an existing website - all with the touch of a finger. 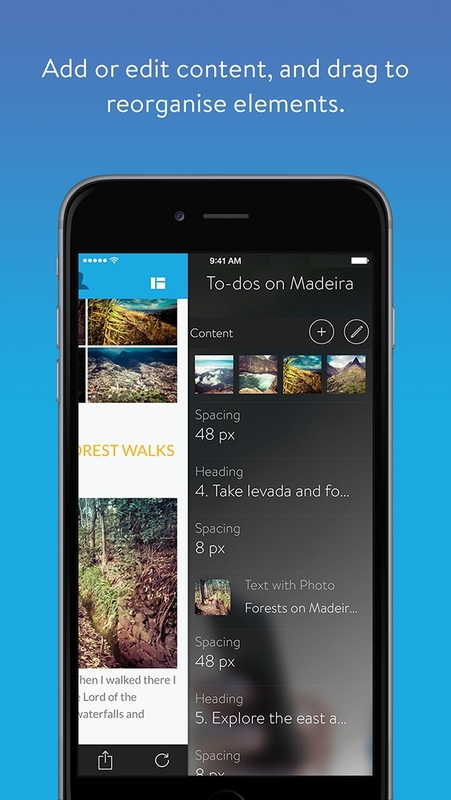 Keep reading to learn about creating pages, adding images and editing content, writing blog posts, and using the many other features of the app. Click on a question to see the corresponding answer. At this point in time, you can only choose images as backgrounds on your Jimdo app. 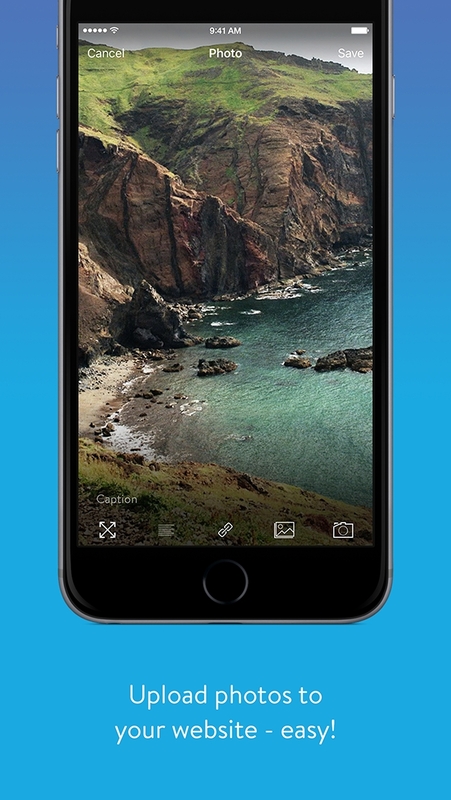 You can set the focal point and edit your background image using the Image Editor. For everything else, please log in from a computer. As you edit the background with our desktop version, you can use this tutorial here to assist. Website statistics are only available for ProBusiness and Platinum users. Upgrade to Pro/Business or Platinum at any time by logging into your website on a Desktop Computer and clicking the 'Upgrade' tab in the Site Admin. 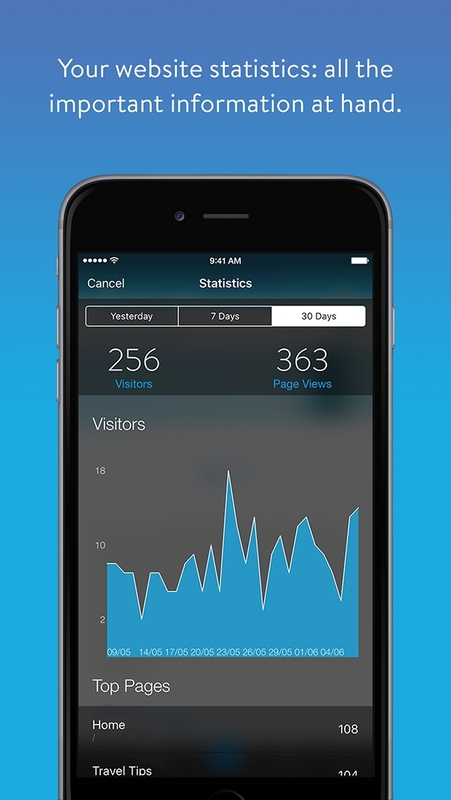 If you are a Pro/Business or Platinum user, simply tap the graph icon at the top of the screen to view your site's statistics. How do I enable comments on my Jimdo site? The comment function can be activated for Blog articles Don't have a Blog? No problem! Alternatively you have the option of creating a Guestbook which lets your visitors leave comments anywhere on your website. To request a new password, please visit Jimdo using a computer. Click on the "Login" button and then "Forgot Password". Enter your e-mail address that you have registered with us, and hit send. We will immediately e-mail you with a link where you can set a new password. How do I open my Jimdo e-mail account with an iOS device? The easiest way: Save Jimdo Webmail on the home screen of your iOS device. Open this link if you signed up with Jimdo before the 6th of April 2016, or this link if you signed up after. Then press down on the tool bar on the "Share" icon and select "Add to Home Screen". How can I change the font color and size? The style of a typeface (font, size, color) can only be changed through the desktop version of Jimdo at the moment. Please login via your internet browser on a computer. More information about our Style Options can be found here. How can I change the arrangement of the elements? New items are always inserted at the bottom of a page. You change the order of your items on a page by opening the right-side menu in the app and pressing the "Pin" icon. On the right of each item you’ll then see the "Order" icon. Hold this icon next to the item that you want to move and press and "pull" it to the desired position (drag and drop). When is my Jimdo website online? The cool thing about Jimdo is that as soon as you sign up for a Jimdo site, it's already published and on the web. You can give your family, friends and associates the name of your site and they will be able to see it from anywhere in the world! How well your website ranks with Search Engines is a different story, though this is something that you can influence. Note that the SEO (Search Engine Optimisation) settings can be adjusted only on the computer version of Jimdo, and not through the app at this stage. What does the message "Element not editable" mean? 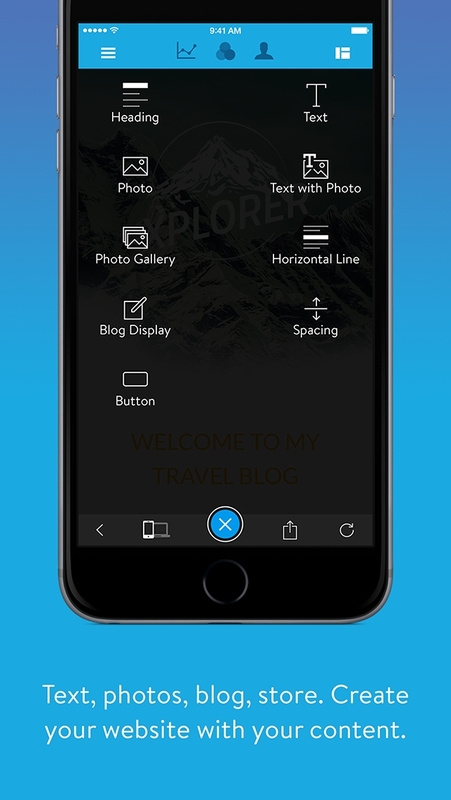 While our mobile app for iOS, iPad and Android makes it possible to edit your website on-the-go, we do recommend using our Desktop version to initially create and add the bulk of your sites content due to an extended range of features and overall ease-of-use. However, due to the increasing popularity of mobile devices, we are constantly working to expand and improve the Jimdo app. The message "Element not editable" means that the particular function that you’re trying to use with our app isn’t currently available. How do I edit the navigation? 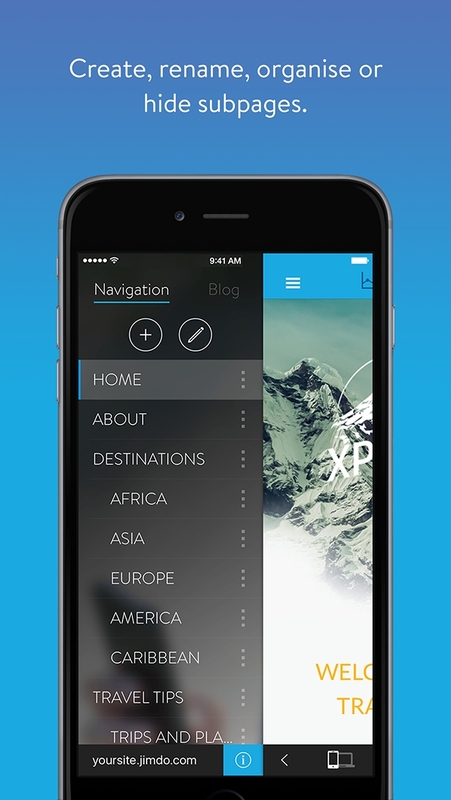 To edit the Navigation your Jimdo page, choose the left side menu in the app. Here, you can select the ‘Navigation’ menu where you’ll see an icon of a plus (+) symbol and a pen to add and edit pages accordingly. How can I link text? Highlight the part of the text that you want to link. Then, click on the icon on the chain. Now you can "link" an external web address or internally to another one of your subpages. How can I delete my Free page? To cancel your Free site, please log in to your Jimdo website on a computer and navigate to "Settings" in the Site Admin. Under the "User" sub-menu you'll find the option to delete your website. Will there be new features released on the Jimdo app? Sure! We are constantly working on developing our app. To tell us about what features that you'd like to see released, please use our feedback form directly in the app or shoot us an email through to: mobile-support@jimdo.com. You can also follow our blog and read our newsletters to learn about new features we are introducing in the near future. How can I upgrade to Pro/Business or Platinum with the app? An upgrade is not currently possible via our app, but exclusively with the computer version of Jimdo. Simply login with a computer to your Jimdo site to upgrade. You can do so at any time by selecting the Upgrade option in the Site Admin.